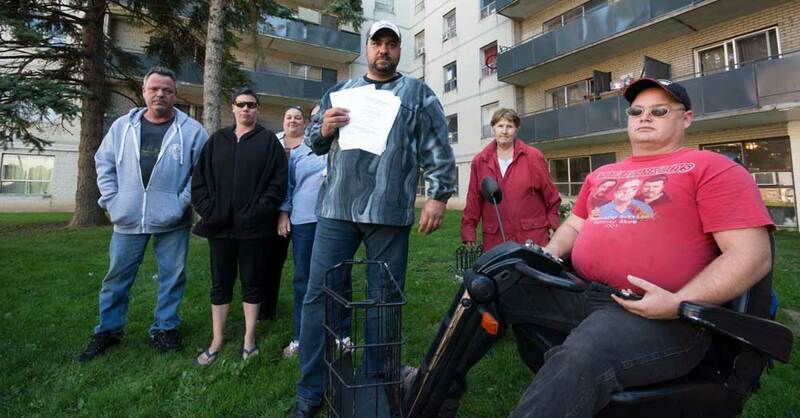 Raymond Fortune, center, stands with a group of other tenants outside their home at 275 Wentworth St. W. Fortune holds a stack of notices from the landlord for shutting off the building’s water, of which 28 have been issued for the building in 2015. The tenants, who are appealing to the city for help, also complain of water leaks, mice, cockroach and bed bug infestations and are receiving no help from building management. Walking through the front doors of 275 Wentworth St. W., an aging apartment flanked by another apartment and a Beer Store, the stale smell of cigarettes, a tenant’s cooking and pungent cleaning product mix in the air. Despite the smell, the apartment is unassuming. A wall of silver mailboxes sits to the left and the dual elevators standing guard straight ahead. It is only when one rises above the second floor that things start to deteriorate. 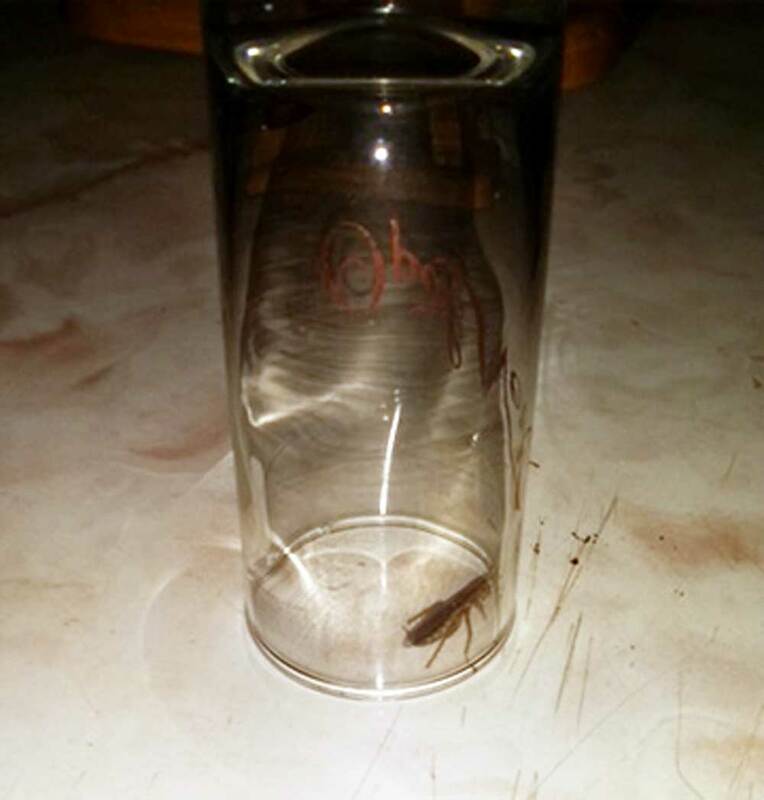 Raymond Fortune, a resident of the apartments at 275 Wentworth St. W., says complaints to management about things such as bugs, like the one caught here, have gone ignored. The elevator rises, then drops into place with a jolt that sends stomachs bouncing. The odour is worse up here and the linoleum floor is chipped in places and completely missing in large portions. Paint is faded and drywall sags beneath water that has seeped through the ceiling. Plaster is slabbed over a portion of ceiling that previously collapsed. These signs of disrepair are only the beginning of the neglect that has led to some of the worst living conditions in Oshawa. Raymond Fortune, a tenant in the building, is looking to change that, giving back power to renters and banishing the mice and cockroaches that infest the apartment’s walls. “It’s overwhelming and it’s been neglected and let go for so long,” Fortune says. Living in the building for nearly a year now and taking care of his mother, Fortune says there have been 28 water shutoffs in that time, another of which occurred last week. Complaints to management have gone unheeded, and according to Fortune, city bylaw officers have been to the building, but with only small fixes, nothing has changed. “You can’t put a bandage over a bullet hole,” he says. Fortune is not the first one to make note of the terrible conditions in the building either. Complaints riddle the Internet on business review sites, complaining of awful conditions, bug infestations and no changes, some of which date back to 2011. The Express also attempted to contact a number provided by the tenants that connects what is presumed to be the Rose Garden Apartments head office – however, requests for comment were not returned. Calls to the city’s bylaw department and requests for information regarding 275 Wentworth St. W. were not returned as of press time. The Oshawa Express has filed a request for this information through the city’s clerks department. A renter most of his life, Fortune says he has been taken advantage of at previous apartments, and now that he has studied up on this rights through the Residential Tenancies Act, he’s looking to form one of the first tenant associations in Oshawa in 57 years. Fortune says the education process is not there for tenants to learn what they can do with absent landlords. He’s looking to help with that and assist tenants in need, starting with his home building. “You take two steps, and I’ll take a million,” Fortune says. Fortune and other tenants will be appearing before the city’s corporate services committee on Oct. 26 in an attempt to urge the city to take action. The chair of corporate services, Councillor Amy England, says that while she can’t speak directly to specific bylaw complaints, she wants the city to be more proactive when it comes to these types of complaints and perhaps start a project to go after these absentee landlords. “We can’t centre out one individual property, but I would like to see us be more proactive in terms of our bylaw enforcement and maybe start in the south end with making an example of absentee or slum landlords,” she says.